The aim of Birthing Wisdom is to bring out and complement the knowledge, skills and qualities the women bring with them to the course. On a physical level this could mean teaching relaxation skills or birthing positions. On an emotional level it could be deeply listening and practicing being fully present. On a mental level it could be having enough clear and up-to-date information to enable the pregnant woman/couple to make informed choices or exploring our unchallenged beliefs and their impact on the birthing woman and environment. On a spiritual level this could mean helping the mother/father connect and bond with their unborn child during the pregnancy and Birth. being open, able to release control, moving with and surrendering to the process. being able to move from our thinking brain into our knowing body and deeper intuitive consciousness. trusting ourselves, our intuition and our deep woman wisdom. keeping connected to our centre and source of strength. In the following birth story, threads of the philosophy underpinning Birthing Wisdom are woven…read on. I remember…during a birth, sitting in the corner of a darkened room in a simple bungalow. There was hardly any furniture. A bed, a couple of chairs, some cushions and a big pile of books. All over the walls were inspiring pictures of beautiful landscapes, mainly of wild seas and flowing rivers. The woman was kneeling on the bed resting over some bean bags, quiet and still. As the next surge/contraction began, she raised herself and started her birth dance, spiraling her hips to some tune only she could hear, her breath flowing freely like a meandering river. She seemed to know exactly what to do at every moment. Her whole being responding with exquisite beauty and power to the waves of raw energy coursing through her body. 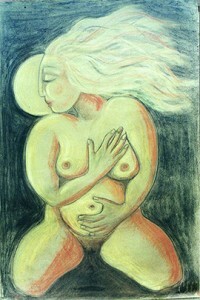 There was woman..in her power.. birthing Goddess.. needing no-one.. whole onto herself. No text book she read, no technique she practiced could have taught her how to be this birth dancer. The wisdom guiding her was from deep within herself, from the same well that many other birthing women had drunk before. I remember this Birth dancer at another point in her birth, confused, searching for re-assurance and guidance from outside herself, having lost the magic thread that had weaved such a powerful path through the crashing contractions. 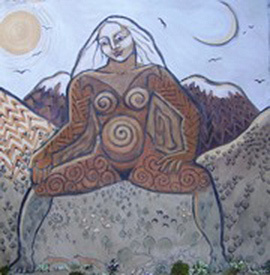 There was woman…in her vulnerability… her human fragility, sometime needing a touch, a word but above all yearning for the total loving acceptance and ‘presence’ of another, to reach beyond her wall of fear and resistance and re-member the powerful goddess she also is, and the resources and wisdom deep within her. 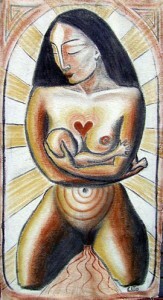 A birthing woman is both vulnerable and powerful, human and Goddess. When lost in her human fragility she may sometimes need the ‘Presence’ of another to help her re-member all that she is, all that she can be. She had prepared herself for this Birth, although most of her preparation had been about undoing, unlearning and remembering…..in the end her birth story was her life story. We birth as we live. In this time when so many of us live our daily lives struggling to stay connected and aware, many women seem to need to consciously prepare themselves for birthing well. This preparation may take many forms. There are as many ways to birth as there are to live and just as our birth impacts on our experience of life, our life experience impacts on our Birth. Some of this life experience forms part of the birth tool kit or medicine birth bag. Other experiences will need to be released, healed or transformed as part of the birth and parenting preparation. Preparing for the Birth of our child is a personal journey, not a standard path. We have gathered over the last 17 years the best tools we have found from the many birth preparations methods around and also created our own out of our experiences as doulas, childbirth educators, mothers and coach/counsellors. Out of all this exploration, our approach eventually emerged and it is an on-going organic process, like life itself. Explore our site, and if you feel the calling, send us an email, give us a ring or come and join us on of our Intro days.